Notch? What’s that? Samsung has been openly critical of the notch-bearing displays we see on the iPhone and every Android phone under the sun, and it looks like the company won’t change its stance next year. 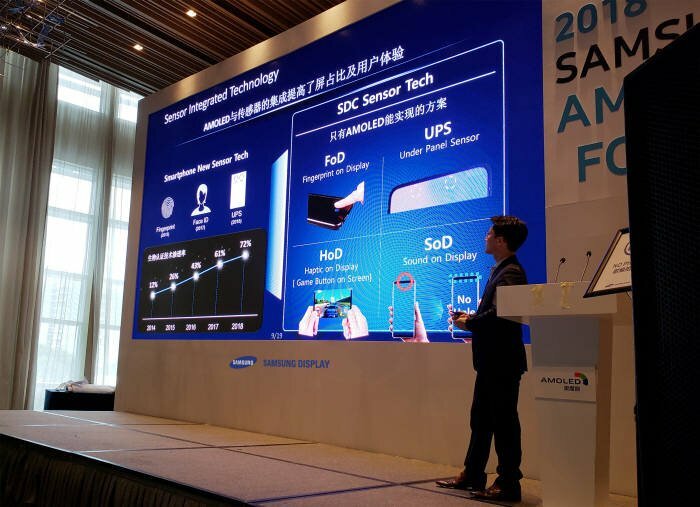 At the Samsung OLED Forum conference on October 18 in China, Samsung revealed its new display technology, which will have everything from a fingerprint sensor to the camera modules underneath the panel instead of requiring a notch to accommodate them. Galaxy S10’s bezel-less display and features revealed? Many patents have already hinted at the Korean giant implementing fingerprint sensors and selfie cameras under the display, and it looks like all of it could soon be seen on an actual device. And the chances of that device being the Galaxy S10 are pretty high. Again, the best part would be the fact that Samsung isn’t taking the path that other manufacturers have taken and putting a notch on its next flagship. Samsung’s new display technology will also have the ability to transmit sound, although it’s unclear if Samsung is talking about regular speakers or something like bone conduction technology for transmitting sound to the user’s ears during calls. What Samsung’s new technology doesn’t seem to support is something like Apple’s Face ID, or 3D face scanning as it’s more generally called. While a fingerprint sensor under the display would be great to have, some might not take kindly to the lack of a 3D scanner on the Galaxy S10, especially since it can be quite a fast way of authentication. Iris sensors are still more secure, but 3D scanning can be noticeably faster and more accurate even in low-light. Of course, there’s no telling exactly what the Galaxy S10 will have and what it won’t, but we’re certainly intrigued by what Samsung Display seems to have in store for us. Samsung’s display tech is on the right side. The left side is talking about general smartphone tech that has come out over the years, including Face ID. Samsung’s display tech is under the SDC Sensor Tech heading on the right. That would be killer. No notch, no holes in the screen…. Perfect. Though I’m not sure if would be ready for S10…….but maybe! i think only several of those tech will be installed on S10.. maybe SoD & FoD..
Glad no notch and as long as Samsung keeps with the no-notch design then I will continue to be a customer. The notch is effing ridiculous and beyond stupid and ugly! What about the selfie cam? Some say that it is written in the article and even shown in the image. Looking good. Now release a model with a flat display and we’re talking. no.. i as samsung curved phone user don’t have any distortion problem.. maybe your eye have a problem.. my advice, hit your head onto the concrete wall 10 times, keep hit your head until your eye turn normal..
Something tells me that’s exactly what you did. I agree they should provide a flat model. The edge screens have prevented me from upgrading from my beloved flat S7 the past 2 years. When they released S6 and S6 Edge, most bought the S6 Edge from there on Samsung focused on the majority which wanted curved displays. it was bigger screen, bigger battery, not only about the edges. Same with s7e – bigger screen, bigger battery. Well yeah. As a rule, people are stupid and follow stupid trends and fashions. They wear crappy shoes that destroy their feet and eat junk food that turns them into diabetics and have their limbs amputated. That doesn’t mean we all want to be like that. Yeah, we need to start making square wheels soon. Rounds ones are so boring.. There are rumours going on about Note10 missing the headphone jack, I hope and pray it’s false. 😢 I got the Note8 which is still fantastic, but if they actually do this, then they’ve lost a customer. Really? This amazing thing they’re hoping to accomplish and you’re shaming them for not having a 3D facial scanner!? You said yourself it’s less secure than iris and slower than a FPS. Honestly, you can really tell how Apple has imprinted on people that they’re the best when they’re able to sell slower, less secure tech as “the best” and people believe it! I’m hoping they’ll at least have the Iris scanner still with the FPS. That’s why we say some might not like that, not everyone. But compared to the iris scanner, Face ID is faster even in the dark with just the phone’s light on your face and it’s not that less secure to be ignored. But I have an inkling that it’s Samsung’s not-so-optimized software that makes facial recognition and iris recognition not be as fast as they can be. And yes, with fingerprint sensor under the display, I’d not personally use iris or 3D scanning at all, just like I don’t on the Note 9.